Nan and I made a quick trip back to our old stomping grounds in Aspen this past weekend. It was a chance to catch up with friends and ski some familiar terrain. We have skied two days here in New Mexico this season, at Sandia Peak and Taos, but we really wanted to ski in Aspen again after not having skied there in almost four years. Early on Saturday morning, our friend Mike, who has been our first mate on every major sailing adventure with Whispering Jesse, including our trip to Bimini last April, and who works for the Aspen-Snowmass Skiing Company, met us at the base of Aspen Highlands to get us set up with rental skis and lift tickets. Then we took a couple of lift rides up to the summit for unmatched views and easy skiing on blue groomers. The weather was beautiful and the snow softened up nicely. Mike headed off to work at mid-day, and we picked up Lori, our friend and generous hostess, and her friend Judy for some afternoon runs. 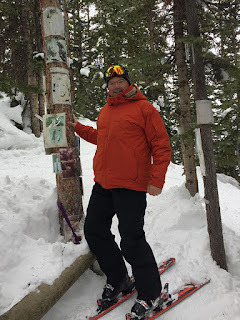 The original plan was to ski Snowmass on Sunday, but Nan wanted to meet up with friends instead, so Mike and I opted to ski closer to home at Aspen Mountain. The weather was deteriorating in the morning; a front was blowing in from the west with dark clouds and high winds. The lighting was flat and the snow stayed firm, so we stuck to the blue terrain and skied runs off the top of the mountain. 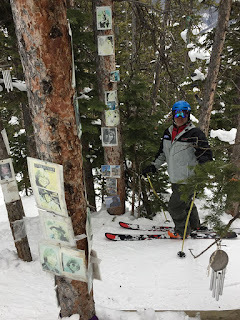 On a whim during one of our chairlift rides, I asked Mike if he knew where the John Denver shrine was located. Aspen Mountain features many shrines--memorials to beloved locals and famous celebrities who have passed away. 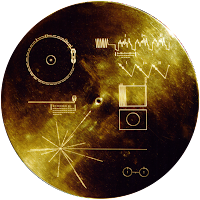 The first ones I knew about, back in the '90s, were dedicated to Jerry Garcia, Elvis Presley and Marilyn Monroe. One was erected in John Denver's memory shortly after his death in October 1997, but I had never known where it was located, only that is was off the Belissimo ski run somewhere. Mike didn't know where it was either, so we stopped at the Skier Services hut at the top of the lift to request directions. "Can you tell us where the John Denver shrine is located?" I asked. The employee there, a guy wearing a goofy cowboy hat, responded, "No. I grew up here, so I can't tell you. Otherwise, I could. I can tell you that it's that way," he said, pointing down the hill. "Not that way," he said, pointing up the hill. We skied away without thanking him for his arrogant lack of assistance. A little later, we ran into Steve, a ski patrolman Mike knew, and he explained to us exactly where to go. Following his directions, we skied down the steep part of Belissimo, bore to the right in the flats, and then looked for tracks going into the woods on the left side of the run. Mike led the way as we traversed several yards into the spruce trees, and there it was. I wasn't sure what to expect, but it was mostly faded photos and publicity shots of John from different phases of his music career, plus some wind chimes and a makeshift candle lantern. The item that struck me was a photo of John in his later years, looking a little scruffy, with the announcement of his memorial service printed below. I told Mike that Nan and I had attended the service as guests of John's family. I was John's computer consultant back then and had been up at his house helping him get his technology in order for his trip to California just a few days before he crashed his plane into Monterey Bay. It's difficult to believe that John has been gone for almost twenty years now. Like his many fans and friends, I still miss him.